Are you wondering how to draw a heart? This tutorial gives you a quick and simple trick for drawing hearts in a drawing tool or on paper. This tutorial shows you an easy way to draw a heart using a drawing tool. I use Inkscape, but the basic approach will work with any drawing tool, or even pencil and paper. As I write this, Valentine's Day is approaching and I wanted to create some heart-themed crafts. There are lots of free heart shapes around that I can use, but I started wondering how you could make a heart shape. I'm a mathematician so I knew about cardiod curves and fancy equations for generating hearts, but I thought that was over the top for a basic heart! Luckily I found a neat little trick for drawing a heart. Lots of other people know about this, but I hadn't thought about it for ages for some reason. It's also a cute trick to show kids who are learning geometry. First draw a square. Yes, really, a square. Have a sneak peek ahead if you can't see where this is going. But honestly you'll need a square. Make sure it really is square. Some drawing tools have a square tool, in others you'll need to make sure the width and height are the same. Now you need to rotate the square through 45 degrees to get a diamond shape - but keeping the right angles of the square. Some tools offer a tool that allows you to rotate through 45 degrees. In Inkscape I can check that the height and width are equal. Put your diamond to one side for a moment, we'll come back to it in a moment. Now draw two circles. The diameter (that's the longest distance across the circle, twice the radius) should be equal to the length of one of the sides of the square. Now we assemble the diamond and the circles. Line up the diameter of each circle with one of the top edges of your diamond. They are the same length. You can get some interesting variations by adjusting the circles a little. But this is the basic design. Now join the pieces of the heart together to make a single shape. In Inkscape I use the Path -> Union tool for this. You can then change the color and stroke (outline) of the heart. Now you've got a basic heart shape you can make adjustments to it to make it fatter, thinner or hollow, or skewed. Or um, whatever your heart desires. 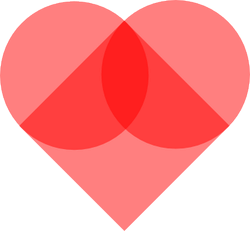 Are you looking for free heart SVG files for craft cutters. I've put together a collection of my favorites. Great for Valentine's day and other romantic occasions and kids crafts. I like this - I know my daughter will enjoy it too. I'm going to cut the shapes out of paper and assemble them together for her like a magic trick. She loves it when I do origami for her. Special Coloring books for a love filled day! Have fun with tons of valentine themed coloring pages and indulge yourself in a lovable activity with your friends and family. Get your pre-schooler involved in the Valentine's Day fun this year! Here are some ideas to get you started.